Outsourced Bookkeeping – Is Your Firm a Candidate? As we have the pleasure to work with solo and small law firms across the country, we often the find the role of bookkeeper to be a tough one to fill. While most solos and small firms may not need a full time bookkeeper, they end up either trying to do the work themselves, having a spouse or partner come in “a few days a week” to do the work, and never having a consistent role being played at the firm that ensure that the finances, regardless of how “simple” the firm thinks they are, are in order. 1. Time entry – if you bill by the hour, someone needs to be certain that time is getting entered into the billing system. We don’t recommend you make the bookkeeper enter it, but we do recommend that you have a policy for contemporaneous time entry, and that your bookkeeper looks at daily or weekly time reports to be certain people are not getting behind on their time entry. Trying to remember what you did for a client on the 3rd of the month when it is the 31st of the month and you are about to run bills is a rock solid recipe for losing money. 2. Expense entry – if you advance costs for clients, you need to have a process for expense recovery, and a set of eyes who reviews your bills and identifies opportunities to recover costs. You are not the bank, and you are not obligated to bear the costs. But in small firms, this often gets missed. The partner/owner/solo runs to the courthouse for a hearing, tosses a $5.00 parking fee on their personal debit card or the company credit card, and then never goes back to the office and enters an expense to be recovered from the client. A dedicated bookkeeeper would have the task of reviewing the company credit card, check register, bank statement, and bills to be certain all of the costs advanced have been properly invoiced for recovery. 3. Prompt billing – bills should go out every month, or every quarter – whatever frequency you have adapted – but it should be consistent. Not when the partner/owner/solo has time to sit down and “do billing.” You cannot get paid if you do not send bills. 4. Collections – bills that go out should be paid by your terms. When they are not, someone should be following up for payment. Solos and small firms are not in the position to finance their client’s legal bills. 5. Accounts Payable – you want to get paid, and so do your vendors. Often “paying bills” is done when the partner/owner/solo has time, or, they get a bill and simply pay it without regard to the balance in the operating account, or without considering what other bills are scheduled to be due. Managing accounts payable is not something that should be ignored. 6. Bank Reconciliations – all of your operating accounts and trust accounts should be reconciled monthly. All too often we log in to online banking, see a positive balance, and figure we have money in the bank. Make sure you are aware of the Colorado Rules of Professional Conduct governing your clients’ funds, trust account reconciliation, use of trust accounts and the like. 7. Reports/Month End– what is your AR balance? What is scheduled to be paid? What are the bank balances? How much WIP do we have waiting to be billed? It should be someone’s responsibility to run these reports – and make sure the partner/owner/solo understands what they mean. 8. Payroll – even if you outsource it, someone needs to be submitting it weekly or monthly. Allowing that to be a task that falls on the partner/owner is not the best use of time. While this list appears long in article format….it might not actually represent 40 hours of work per week, and you may not want to increase your firm’s overhead with the cost of another employee (salary, benefits, technology, office space, PTO, health insurance), even if they are part time. If you are not in a position to hire a bookkeeper, consider outsourcing the position. While law firm bookkeeping is a unique skill, your CBA member benefits partner, Affinity Consulting Group, provides a service (YourBooks) where you can pay hourly to have your firm bookkeeping (or any part thereof) handled for you. 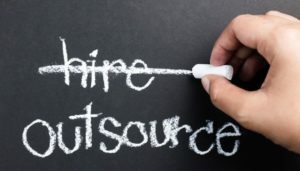 Whether you need a full time outsourced option, or, are looking to cover a medical leave, a maternity or paternity leave, a vacation, or a gap as you find the right employee for the position, don’t underestimate the benefit of outsourcing these tasks so that you know they are getting done timely and accurately. As a partner/owner/solo, you don’t have to be the chief cook and bottle washer, too! Previous post: Bitlocker Drive Encryption — Read This!